No language too crude. No topic too obscure. OneOf99 wrote: You should anyways. Butter it up and then dip in some banana pudding. I hope tomorrow goes well. For my friends already there, please hold the line. Cody, your curse is a gift! Everyone does their thing differently, and you are unique in the fact that you compose and draw in ways others do not! I'd like to see one of your amazingly complex drawings based on Donkey Kong Island, if I may ask. I have a feeling that the way you would draw DK Island would bring back many nostalgic memories for us! Who doesn't like a little nostalgia, eh? Here's another random thought: Her'es is apparently a word, unlike fgnhowd and ldcmjd. What about hfhjidig, or yhdfhjfiwq? I think you're quite the hfeuigsh, Super Luigi! PegasusMan, sure, actually, I'd love to do that. I wanted to do a DK drawing for a long time and what better to start out than to do DK Island? I'll try to have results done within the week! I also kind of wanted to redraw the entirety of levels (like Jungle Hijinxs), but with details to make them really stand out. I think it'd be super awesome! Ideally I'd do the whole game. When I get the right materials in the future, who knows? Maybe I will! If we're talking about weird words, "aa" is the word for rough lava with a jagged surface. What is DKC's second world? On the big world map, it looks like a beach, but the levels themselves are ruins and caves. Finally, a question relevant to DKC! I believe the wooden planks covering up the holes in the walls acts as the indicator that mine levels are present. The ruins levels, however, I think are only pictured on an individual world's map, not on the big world map. Now that I think about it, the scale of DK Island in DK64 is clearly scaled down from the DK Island in DKC. Wouldn't it be amazing to keep the same scale in DK64? With today's modern technology, we certainly could. I also want a sequel to DK64, and it should be both silly and serious, fix the original's design flaws (instant Tag-Barrel? ), and have online multiplayer of some capacity (Perhaps Kongs not found in the main game could be here as well, like Krusha was in DK64?). We cannot underestimate the value of blankets and pillows. A sequel to DK64 would be amazing, and I love the instant Tag-Barrel and multiplier ideas. Yes, blankets and pillows are very valuable. But do you know what else would be valuable? A sequel to DK64 made by Retro Studios! How likely do you think a collectathon like DK64 would be created by Retro in the coming years? I don't know. Maybe that's the hint Reggie gave many months back? Then again, he could have been referring to Tropical Freeze with Funky Kong. Hopefully, we will all succeed greatly together forever. As ridiculous as that may sound to some, I still believe that it can be done. Also, Dixie Kong is a true hero(ine) for our time. Pardon my asking, but what makes her so special? I for one favor Diddy Kong more. Even back in 1995, Dixie Kong was bold and heroic. Although her appearance has changed in recent years, she's just as beautiful, if slightly more cute. I will never forget her great courage, brilliant hair, and charming personality. True, I agree with the fact that she was bold and heroic. But what about Diddy Kong's determination to follow in Donkey Kong's steps as seen in DKC2? I believe that Dixie Kong has a role model like Diddy Kong does. In my personal opinion, Dixie is the best female video game character! I love her! Still haven't finished DK Island, but I did whip up a few more pieces that I posted in the art thread! I also worked a liiiitle bit more on "Time Is Up", giving a bit more padding to the main track in addition to working on a transition towards the end. ^ I still need to expand upon it a lot more but that'll come in due time! I'm excited about it!!! If DKC2 released today, certain people would claim that Diddy was sexist. Thankfully, that's not the case. Did you hear that Nintendo removed Tropical Freeze from the Wii U eShop? I'd post the question in TF's forum, but it doesn't seem that important. Also, Nintendo is being sued by patent trolls over the Switch's Joy-Cons. Speaking of Tropical Freeze, I'll make another topic that shares GameXplain's review of the Switch version. I can see why they'd remove it from the Wii U eShop, but hopefully people will still be able to re-download it if they had deleted it. Here's a random thought: Spring is strange. Is autumn also strange then? Ahh, I like the sitar much better, Cody! Excellent choice! It blends very well with the strings in the background! Once again, I cannot wait until your WIP is finished! Quite frankly, if you ended it now, I wouldn't be too upset! It's already very good and I can't wait to hear the final product! I'm beginning to wonder if the Cranky Kong we see in Returns and Tropical Freeze is actually DK from the Country trilogy. Either that, or the modern duo of games take place before the Country series. I like to think that the Kongs never age. Or at least the time in between each game is shorter than in real life years. But I certainly believe that the Cranky Kong from Returns and TF is the same Cranky as in the DKC Trilogy and before. Dixie definitely acts younger in Tropical Freeze. I know cuteness sells, but she should be as cool as she was in DKC2. Modern audiences would approve. This might sound strange, but I want to see Dixie and Tiny in a game together. Better yet, why don't they actually do something? That would be nice. Also, I have not forgotten about Diddy, DK, and Cranky, for they are true family men. Unless they all join forces for one big game, why not Donkey Kong Country Pink and Blue? Throw in a battle royale mode with many Manky and much paint, and you will definitely appeal to modern audiences at the cost of DKC's integrity. Donkey Kong Land III holds up against Donkey Kong Country 3. I haven't finished the former yet, but it stays true to the latter more so than Tropical Freeze. Wowee, I haven't been here in AGES! I wonder how things are going? Welcome back, dear Geno! I hope you're doing well. Although the forums are quiet, they are also peaceful. 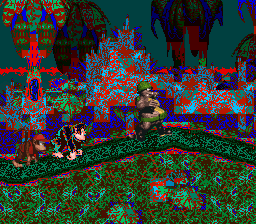 Check out L_Sky's newest DKC3 creation, for it is important. Monkey Mines really looks like the outskirts of my home, although I don't live on a cliff. My jealously of your residence has increased, Super Luigi, tenfold because of that statement. I would love to live in an environment similar to Vine Valley, with the setting sun, the large lake, and the forests of trees. I would become a forest-dweller, though. Oh well. Vine Valley has always intrigued me. I suppose that world would be my home if I lived farther north. I still don't know how the sea is right there, although that could be a view from the cliff. Fun fact: did you know that over 80% of the human population lives in the northern hemisphere? I believe it. The Southern Hemisphere should be experiencing Spring at this time as well, so our days should be roughly the same. Winter isn't all that bad... just look at Gorilla Glacier! How can the Kongs swim the freezing cold water of Croctopus Chase?! It's their island, so they must know how to survive. Plus, Donkey and Diddy were steadily bracing themselves for the freezing lake by scaling Vine Valley and Gorilla Glacier. If that is the case, then how did Diddy and Dixie survive Crocodile Cauldron from DKC2? I've heard the warmest place in a jungle is underneath a gorilla. Combined with Gangplank Galleon, they were probably prepared as well. Plus, Krem Quay came immediately afterwards. Have you played Donkey Kong today?